Classic Women’s Athletic fit. Not too tight, not too loose. 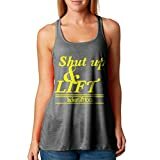 Workout Gear Made for Women! If you’re spending hours in the gym doing SQUATS then this tee is for you!